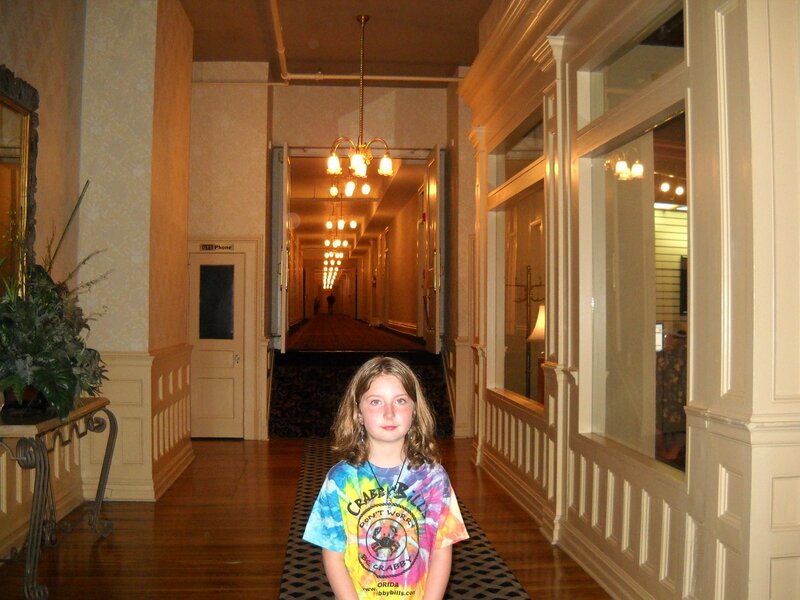 My husband, eight year old granddaughter and I stayed at the Belleview Biltmore in Clearwater FL for a week in room 1321, April 2009. We have had several odd experiences. We had no clue it was reportedly haunted until Saturday evening when we ran into the ghost hunting tour which was standing in front of our room (1321). They were talking about Maise Plant who is seen frequently on our hallway. Also, Obama stayed in a room at the end of our hallway and his security people stayed in our room and complained about paranormal experiences. According to the person giving the tour (and later the bellhop) Obama’s men complained about a desk drawer that kept opening, particularly in the middle of the night. It kept opening for us too until I propped a chair on it. At 3am that first night, I heard a scrapping sound, turned the light on and the chair was pushed away from the desk and the desk drawer was wide open! No matter what we tried that week the drawer would always open when we were not looking. Weird! The second night I had to call the front desk shortly after midnight because young children were running up and down the hallway above our room. I swear I could hear them giggling too. The desk clerk acted a little odd I thought but told me she would take care of it. Monday morning it was a little gray out and there was a slight chill in the air so we spent the morning exploring the hotel. The friendly bellhop came up the elevator onto the forth floor and stopped to chat. I told him about the children the night before and he got “that look” on his face. He divulged to us that it was a complaint they would hear occasionally and there were no young children on that end of the floor that night. He said that Obama’s men complained about young children running up and down the hallway on the floor above our room also. Also on the first day we arrived—Saturday—we went into the indoor pool area for the first time. I admit, it did feel creepy. My 8 year old granddaughter freaked out and started panicking. I have never seen her act like that before or since. She ran out of the indoor pool area and would not even walk down the hallway in the spa that leads to the pool area that entire week. She said there is a little boy in there who drowned and he is waiting for his mommy and daddy to come back to their room so they can go home. I didn’t understand what she might have been talking about until that night when we ran into the ghost tour. When they were in front of room 1301 they said there was often a young boy seen in that room. On Monday morning when we explored the hotel we went on the 4th floor, and I walked up to a part of the 5th floor. There is this one area on the 4th floor where you can get to an attic spot through a hole in the ceiling and an old wooden ladder which is painted white. It is an unused part of the hotel and has original panels in the alcoves with carved designs on the wood. It has an old, unused smell. I saw a face peeking out from there when I started to go up they ladder to look in the hole in the ceiling. Needless to say, I came down that ladder pretty quick! Near the end of the week, when I downloaded my pictures onto my laptop I noticed orbs hovering around my granddaughter in many of the pictures, particularly in the main hallway near the spot where you can open the side door to go in the basement. 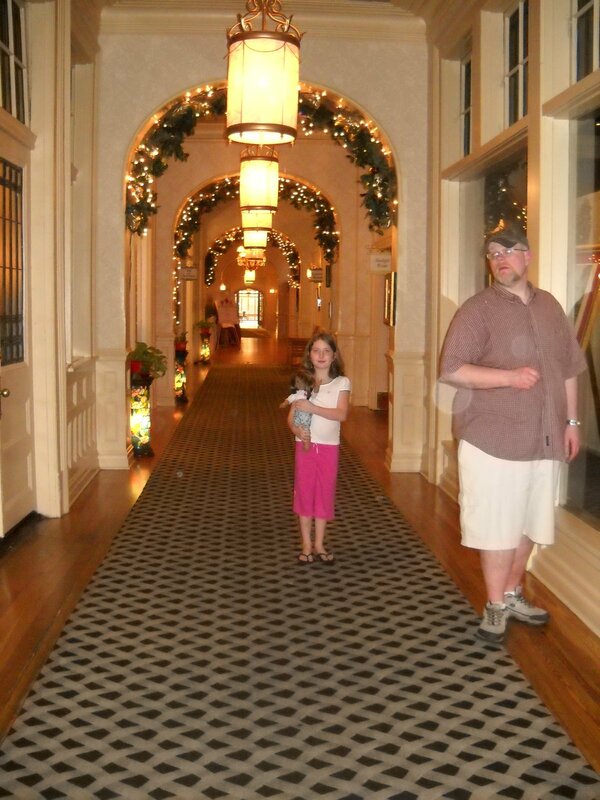 One night after dinner, my husband and granddaughter and I were walking through the main hallway of the oldest part of the hotel. We had no clue that there were possible orbs until I looked at the pictures after we returned home. We did have experiences in that hallway that night though. My husband and I both heard a funny electronic snap perhaps, or crackle of a radio and then we heard faint voices. It went on for about 4 or 5 minutes. You could tell the voices did not belong there. My husband does not believe in paranormal experiences although he does believe in ghosts. Weird, I know. So when he heard that and turned to me with eyes as wide as saucers, he became a believer. I almost want to say it was like a radio cracking from the 40’s or even the 30’s. It had that old time sound. It was rather distinctive. We toured the tunnels underneath the hotel. 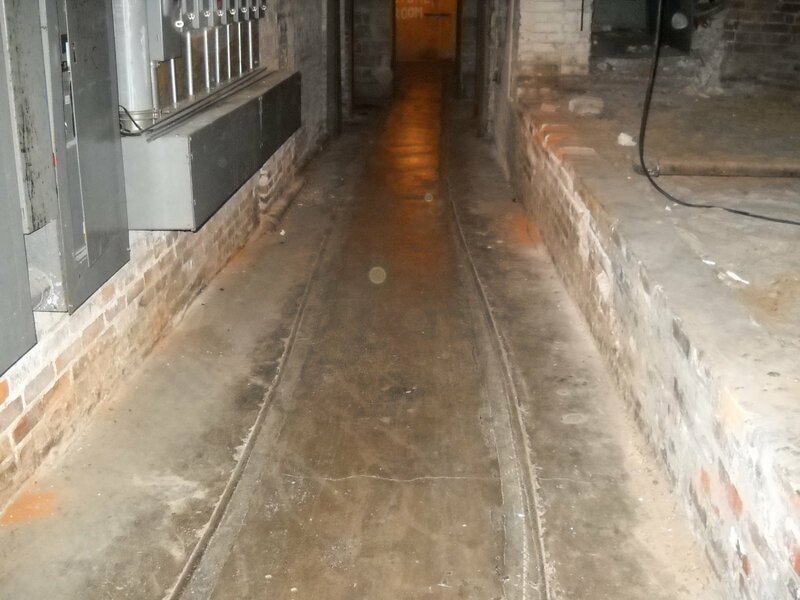 This was an area where servants and children had to walk to get from one area of the hotel to another as servants and children should not be seen or heard, apparently in the Victorian age. At one point I felt icy cold and I started snapping pictures. That is when I caught what I believe to be orbs in the pictures. And on the last night we were there I was walking to our room, alone. When I was directly in front of room 1301 my right arm suddenly went icy cold and goosebumps like I had never had before stood up on that arm and every hair on that arm stood straight up. Only that arm! I was freaking out and talking out loud saying “what the hell?” I kept talking aloud and looking and pointing at my arm. Suddenly this voice said “hello.” I jumped a mile. It was one of the hotel security guys. He told me it was common to be touched in that hallway. Later on that last night, we were walking down that hallway to our room (our room was in the supposed haunted hallway, as I have mentioned). There was no one in the hallway except my husband, granddaughter and myself. My husband was far down the hallway, near our room. My granddaughter was near the old phone booth by the entrance of the hallway. I took the picture then specifically because no one was in the hall except the three of us. But when I downloaded the picture on my laptop I noticed a figure a little ways past my husband. It looks like a man to me. Nothing is blurry in that picture, except that man. He seems blurry, out of focus and transparent. I would swear there was no one there except the three of us. I know that there wasn’t! I have a wealth of paranormal experiences wherever I go and the paranormal group I belong to here in Louisville thinks it’s because I’ve had three trips to the other side with NDE’s. The last trip was October 2011 during open heart surgery when my heart was stopped for two hours and I was kept alive artificially by a heart lung machine. Since then my paranormal experiences occur everywhere I go. The most amazing, far fetched things you could ever hear! And I catch evidence of these paranormal occurrences on EVP and photographs. People that are with me benefit from it too and often witness the same things, like full body apparitions and disembodied voices. For instance, when our group went to a local haunted toy museum I caught 87 EVPs with 54 of them being class A EVPs. I’ve caught several pictures of full body apparitions. I really hope the Biltmore reopens in the future so I can go back and see what evidence and experiences I have now! I’m attaching the picture of the supposed apparition in the hallway just past where my husband is standing. (there is an orb in that picture near room 1301. If you invert the picture you’ll see it.) 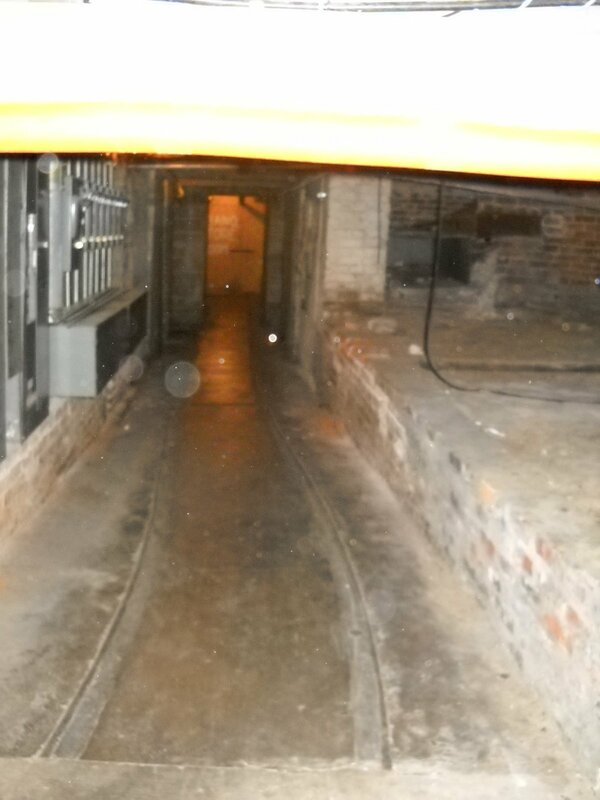 Also a couple of photos of the hallway where what I believe to be orbs are. It was taken immediately after we all heard the crackling sound of an old timey radio and voices, then big band music. At the time we opened the side door where that hidden staircase is that leads to the basement and it wasn’t coming from there. keep clicking to see actual size! 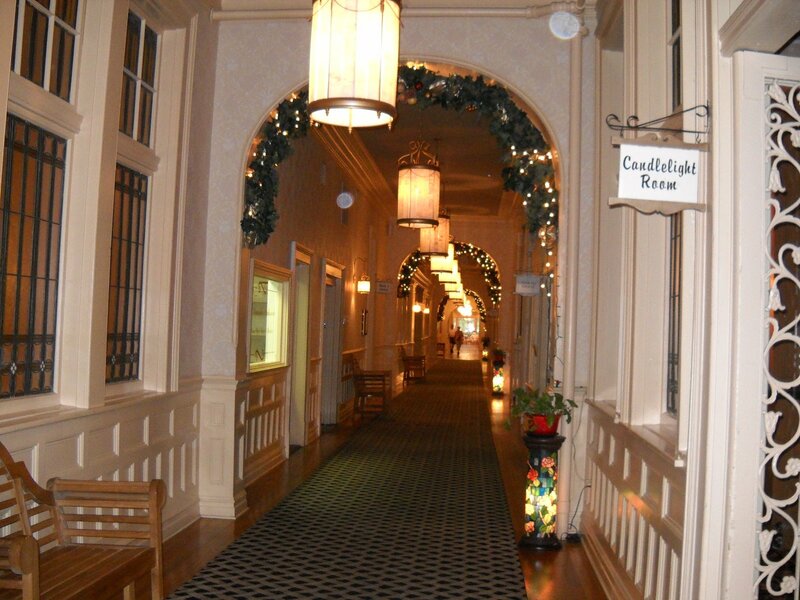 My husband Rob and I conducted the Ghost Tours at the Belleview for four years; in fact, I believe we were giving the tour the night you returned to your room! It was a fascinating, wonderful and extremely haunted place, and I hope to be able to visit it again one day. I sometimes dream about wandering in its halls.